From left to right: Juana Frontela, head of Cepsa Research Center, Alejandro Gautier, Cepsa lubricants specialist, Fernando de Andrés, Cepsa lubricants specialist and Niurka Sancho, Cepsa director of lubricants. Photo courtesy of Cepsa. 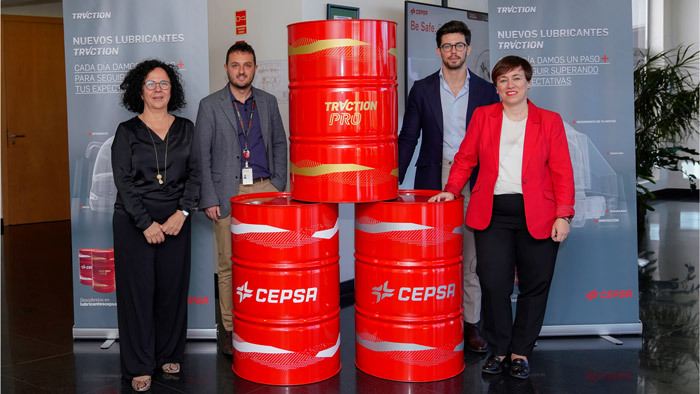 Spain’s Cepsa has unveiled TRACTION, its new range of high-performance lubricants for heavy-duty vehicles, offering significant benefits such as increased efficiency and improved engine protection, component durability, vehicle reliability and improved fuel economy. Using advanced dispersant technology has made it possible to obtain extraordinary results under the most severe engine cleaning tests, significantly reducing the formation of deposits and sludge, ensuring the protection of all engine parts (including the turbocharger and the gas post-treatment or DPF systems), and in turn longer engine life and improved operating efficiency. Another characteristic of these lubricants is their next generation detergent and anti-wear additive, which helps to improve cleanliness, and less wear and minimization of oil degradation, which translates into better lubrication and vehicle operation. In addition, lubricants marked with the ‘Fuel Economy’ label are said to have proven to reduce fuel consumption, thus contributing to reducing greenhouse gas emissions. A digital tool has been launched on lubricantescepsa.es to facilitate the calculation of annual savings. “Our goal is to continue offering our customers state-of-the-art products that meet all their needs. TRACTION offers the optimum alternative to each of the applications of heavy-duty professional diesel vehicles and machines, improving their performance and prolonging their life,” said Niurka Sancho, director of the company’s Lubricants business, during the product launch at Cepsa’s Research Center. The TRACTION range of lubricants is designed for passenger transportation vehicles and public works, mining, agriculture and freight haulage machinery. In addition, it covers all types of fleets, intra-urban or inter-urban, new or old vehicles and any engine specification. The TRACTION range meets the latest certifications and more than satisfies the requirements of the main specifications of the international market (API, ACEA) and the primary industry manufacturers (OEM). The range is composed of four product lines: TRACTION PRO, TRACTION ADVANCED, TRACTION MAX and TRACTION.